This 14 day tour to Bhutan, Sikkim & Darjeeling and North India offers unique travel opportunity in the Himalayas. Geographical contrasts abound with a rich mixture of ecosystems ranging from sub tropical to the high mountain ranges, which hold a wide variety of endangered species, a wealth of flora and fauna, and the unique cultures and traditions of the people in the region. As one of the rarest and most unique of travel destinations, Bhutan offers the experience of the Buddhist tradition in a setting of unique architecture, and breathtaking Himalayan landscape and friendly people. Sikkim, a former Himalayan kingdom, now a state in India, is richly endowed with a prominently Buddhist culture dating back to the 7th century AD. Darjeeling-“The Queen of the Himalayas” is a bustling tourist town renowned for its tea gardens and the sunrise over the Himalayas from the Tiger Hill and imprints of the British Raj. Day 03 Tour Wangdi, drive back to Paro. Day 12 Visit Taj Mahal, drive to Abhaneri. Fly to Paro in Kingdom of Bhutan. Enjoy the breathtaking views of the Great Himalayas from the flight. After breakfast, you will start your journey down south to Phuntsholing. It is about 180 Kilometers of scenic drive that takes you from the alpine forest of pines and junipers to lianas, orchid and bananas. Within 6 hours of drive, the altitude will drop approximately 6,500 feet. On your way, you will have several stops for great photograph opportunities and will also visit Kharbandi Temple. Phuntsholing town is a bustling trading frontier for Indians, Bangladeshis and other business people who visit here to trade commodities with their Bhutanese counterparts. Evening stroll the Bazaar and visit Zangto Pelri Temple located in the middle of the town. This morning you will be met by your guide from Sikkim, then drive 7 hours through the Indian plains and gradually climbing uphill towards Darjeeling. Evening free to explore the markets. After breakfast, a unique train ride on the Darjeeling Himalayan Railway – “Toy Train” to Ghoom and back. The DHR established by the British in 1881, an outstanding engineering feat of the era, is now a UNESCO world heritage site. Visit The Himalayan Zoo which houses the Himalayan fauna like the Red Panda, black bear, yaks, tigers, snow leopard etc. in their natural habitat, and the adjacent Himalayan Mountaineering Institute - a premier training center for mountaineers and a museum detailing the ascent of the Mt. Everest by Tenzing Sherpa & Sir Edmund Hillary and numerous other expeditions. Also visit Tibetan Self Help Centre, a center of training young people in the intricate art of Tibetan handicrafts and hand looms. Early morning drive to Tiger Hill to for a singular experience of the first rays of the sun bathing the Himalayas. On the return visit the Ghoom Monastery. Built in 1875 the monastery which follows the Gelugpa sect, houses one of the largest statue of the Maitreya Buddha-“the future Buddha”. Continue to Gangtok, the capital of Sikkim. Located east of Gangtok at an altitude of 11970 ft, the Tsomgo Lake is a typically beautiful mountain lake. The journey to the lake offers a magnificent view of Mt. Khangchendzongna and other peaks of Sikkim Himalayas. Afternoon free to explore the markets. Transfer to airport in Bagdogra, and fly to Delhi. Upon arrival in Delhi, you will be met and transferred to hotel. This morning half day tour of New Delhi. New Delhi: India’s capital and an important gateway into the country. Visit Lutyen’s Delhi-drive past President’s palace and also known as Rashtrapati Bhawan, India gate, a World War I memorial. Lutyen’s city is characterized by wide, tree-lined avenues, parks and palaces built for important Indian Princes. Visit Humayuns Tomb, built in the mid-16th century by Haji Begum, the Persian born senior wife of Humayaun, the second Mughal emperor, this is wonderful early example of Mughal architecture. Drive to Agra and overnight in Agra. Morning visit Taj Mahal: - Described as the most extravagant monument ever built for love. It was constructed by Emperor Shah Jahan in memory of his second wife Mumtaz Mahal- described by the Indian classical poet Tagore as a “tear on the face of eternity”. Visit Agra Fort: - Constructed of the massive red sandstone Agra Fort on the bank of River Yamuna, was begun by Emperor Akbar in 1565. The auricular fort’s colossal double walls rise over 20 m in height and measure 2.5 km in circumference. Drive to Abhaneri . On the way, tour of Fatehpur Sikri en-route. Once the capital city of Akbar after the childless Mughal was blessed with a son with the blessings of the Sufi saint, Sheikh Salim Chisti, who lived here. The new capital came up in 1569. Though the juxtaposition of the buildings seems whimsical, they are thoughtfully planned, imparting and atmosphere of playful brilliance. Arrive Abhaneri & check-in to Deluxe tent. After breakfast, walk around village. Take a short camel cart ride and visit nearby Stepwells (baoris)- Chand Baoli is a famous step well. It is located opposite Harshat Mata Temple and is one of the deepest and largest step wells in India. It was built in 9th century and has 3500 narrow steps and 13 stories and is 100 feet deep. Drive to Jaipur. Explore the city starting from the Pink City Palace which now houses a museum containing rare manuscript, painting and an armory; visit the Palace of Winds-a Landmark of Jaipur made of pink sandstone and of unique design. Also visit Jantar Mantar-Observatory (Astronomical instrument). Next to city palace built by Jaisingh in 1728. Jai Singh’s passion for astronomy was even more notable than his prowess as a warrior. Each construction has a specific purpose, such as calculating eclipses. The most striking instrument is the sundial, with its 27m-high gnomon; the shadow this casts moves up to 4m per hour. Breakfast at hotel, visit Amber fort built in the 17th Century; the palace is a distinguished specimen of Rajput architecture. Take a joy ride on an elephant back at Amber Fort. Set in a picturesque location, Amer is fascinating blend of Hindu and Muslim architecture. Built in the 16th century by Raja Man Singh, it sprawls on the hillside. Built in red sandstone and white marble, the palace complex has some very interesting apartments, the likes of which are not to be found anywhere else in the country. 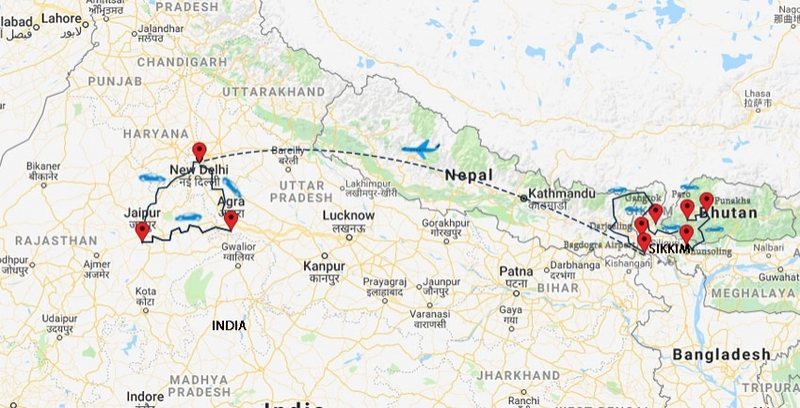 Drive to Delhi, transfer to airport and fly back home or extend your trip to Nepal, Sri Lanka, South India or other parts of Asia. Accommodation with breakfast, lunch and dinner in Bhutan, Sikkim & Darjeeling. Accommodation with breakfast in India. Guided sightseeing tours with entrance fees. Private Transport as per the itinerary. Air U.S.- Bangkok or Delhi- U.S.
Other expenses which are not specified above. Yes, you need a visa for Bhutan and India. We will get your Bhutan visa, and Sikkim Inner Permit. You need to get Indian Visa. All the other permits and entrance fees are included in the trip. The best time to take this trip is Spring and Fall The weather generally stays nice and not that cold in Bhutan and Sikkim, and the chance of rain is very low during the period. This is an moderate trip. However, you have to be physically fit to do the tour. You will be spending from around 8 AM to 4 PM touring around, going from one place to another taking drive and enjoying the nature and world-famous monuments/heritage sites, and experiencing the local culture and way of life in the region. You will be staying in nice, comfortable accommodation with attached bath. Breakfast, Lunch and dinner are included in Bhutan and Sikkim. But in and around Delhi, Lunch and dinner are not included. A decent meal will cost you about $ 10-15 in and around Delhi in tourist class restaurant. If you like to upgrade it to higher end hotels, that is also possible with additional price. Yes, you can extend your trip to Nepal, Sri Lanka, South India or other destinations in Asia. You may like to inform this at the time of booking the trip, should you book the international flight with us. We would be happy to arrange your extension as well.